Last week was a whirlwind and this weekend was no different. I’ve been having difficulty finding time for everything that needs attention. I completely missed my intended Inspiration Saturday post (a followup to part 1 of our Costa Rica trip) because I haven’t had a single second to devote to processing the rest of the 1200+ photos we took on our trip. Instead I was making lotions, working on my business plan, developing a household budget, doing some scientific soul-searching, and finally (FINALLY!!!) cleaning up and organizing my office, which had been a hopeless mess since May and full of no-longer-necessary wedding junk. 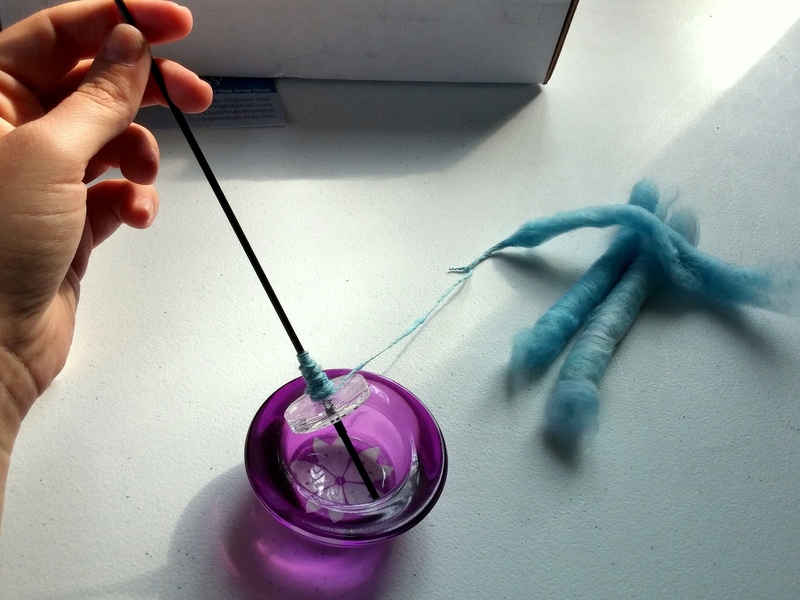 Since that task alone took me about 6 hours, I rewarded myself with 20 minutes to try out the new hipstrings tahkli cotton spindle I purchased at the beginning of July. Cotton tahkli from hipstrings, click for Etsy shop. I’ve noticed a lot of Etsy sellers making punis on Instagram lately, they appear to be all the rage. 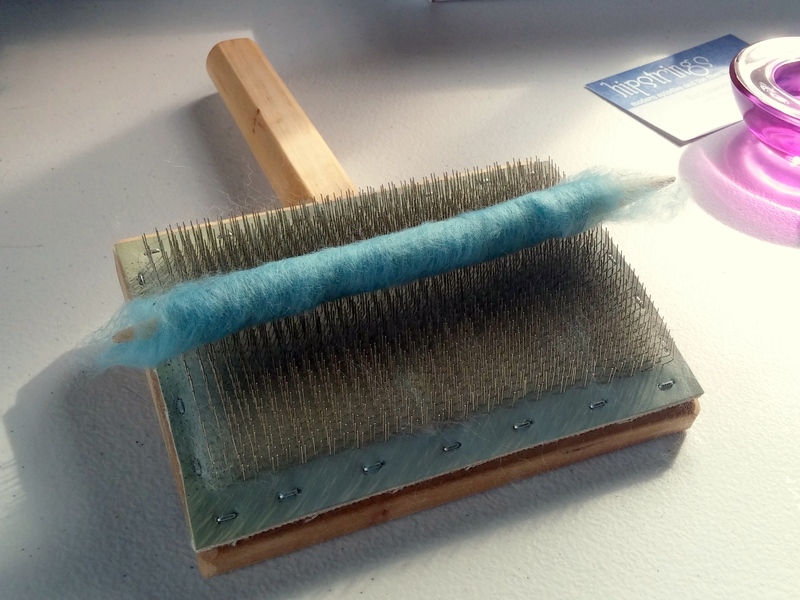 Punis are basically just tightly-wrapped rolags, a carded fiber preparation. They are traditionally used with cotton spinning (and other short fibers) but can be made with any fiber and are typically made with wool blends by Etsy sellers. If you’ve never used them before, they are incredibly easy to make. First, you need to load your fiber onto a hand card, this is called ‘charging’ the carder. I am using Strauch cotton hand cards in the child size. 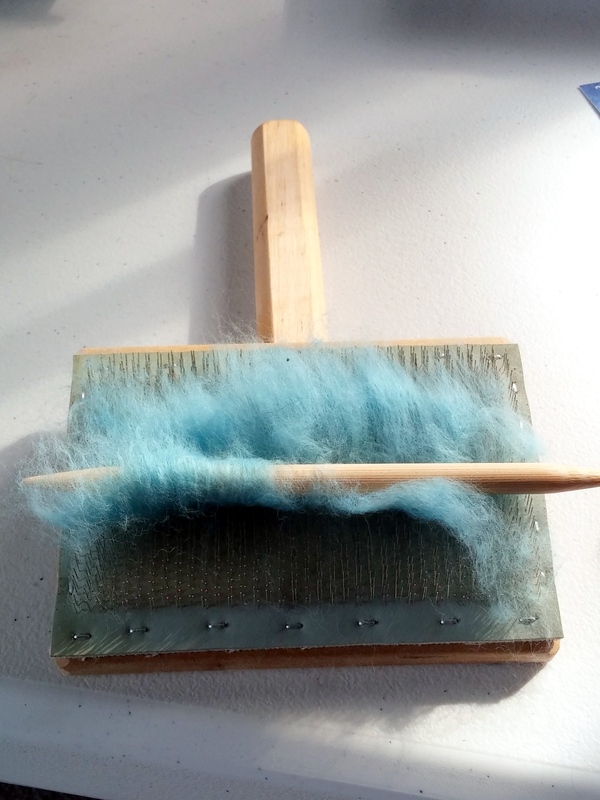 These carders have 255 teeth per inch (many wool carders have between 70 and 100) so they are particularly suited for fine, short fibers like cotton, angora, yak, quiviut, fine merino, etc. The truck is to place just a small amount of fiber on the carder, you don’t want to use too much at once. 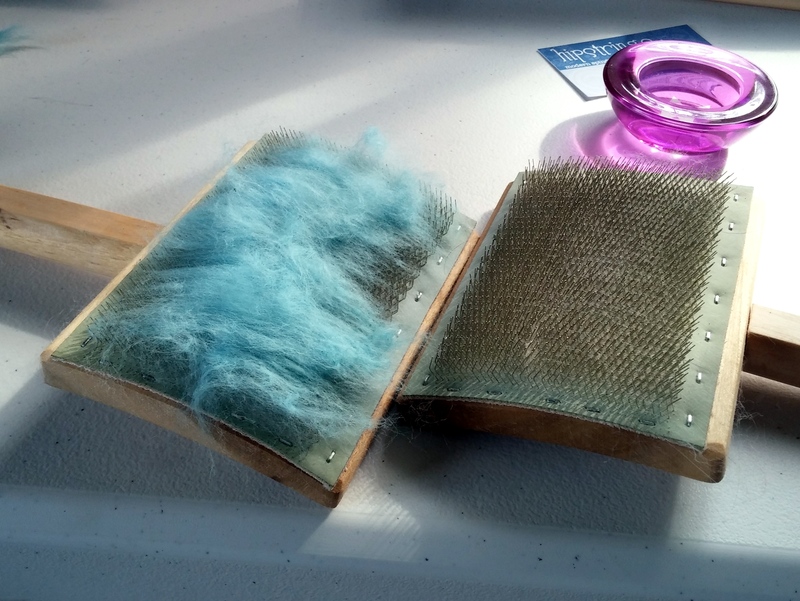 The idea behind carding is just to open up the fibers, get some air in there, and straighten them out a bit. Carded preparations are usually spun woolen style (with the fibers aligned every-which-way instead of straight like worsted) so I don’t fuss over keeping the fibers neatly aligned. I just work on getting them fluffy. There appear to be a ton of different ways to card and after watching a video and reading a book, I basically just do what feels right to me (though those resources are good ones to get you started). For the next bit you need a dowel or a thick knitting needle. You place it near the edge of your card with the teeth facing away from you and roll the fiber up around the needle. This lets you get the edges tucked in neatly and gives you something to manipulate during the rolling. Once all the fiber is lifted off the card and around the needle, you can lift it off and bring it down to the front edge of the card to roll it up a few more times. This compacts the fiber around the needle and neatens up any stray fibers. Then you spin! While I love spinning with supported spindles, the tahkli took a little getting used to. It’s extremely lightweight and does not stay vertical or spin for very long because of it. However, it does spin extremely quickly so it adds twist to the fiber at a fast enough rate to keep it all together. It’s a very different feel than spinning with Russian or Tibetan supported spindles but I’m enjoying the exploration so far. How do you like to reward yourself after a lot of hard work? 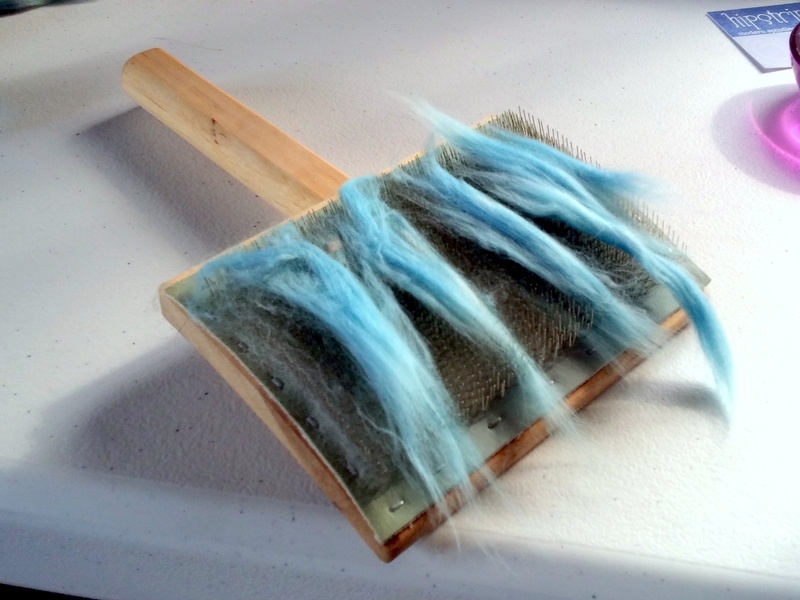 This entry was posted in fiber, spindles, spinning, tutorial and tagged spindles, spinning by shoelaceswitcher. Bookmark the permalink. That looks so nice and simple! I need to gift myself some hand carders, perhaps as a reward? So glad to hear you’ve been so productive! Spinning on my dear old wheel is my treat of choice,,,with an audio book in my ears and a liqueur close at hand. That looks so cool! I have my third spinning class on Sunday, where I will have my first hands-on exposure to carding, I’ll keep this in mind. I have totally been seeing those in instagram, but had no idea what they were- I don’t spin! Thanks so much for explaining it. mystery solved!